WE'VE HAD TO WAIT ALMOST TWO YEARS SINCE THE LAST CURATED SHOWCASE OF FILMS FROM THE ARAB WORLD TO TAKE PLACE IN SYDNEY. A MONTH-LONG PROGRAM OF SUNDAYS IN PARRAMATTA, WITH AN EXUBERANT SELECTION OF PARALLEL EVENTS, THE THIRD SYDNEY ARAB FILM FESTIVAL DELVED DEEP INTO THE RELATIONS BETWEEN FILMMAKING, POLITICS AND THE ART OF SELF-REPRESENTATION. ORGANISERS PLAN FOR THE FESTIVAL TO EMERGE INTO A STRONG AND SUSTAINABLE ENTITY IN ITS OWN RIGHT, AND A HIGH PROFILE EVENT ON SYDNEY'S ANNUAL CULTURAL CALENDAR. Incubated and driven by Information and Cultural Exchange (ICE), the festival upheld an impressive array of partnerships and a feast of offerings with everything from Bedwin Hacker, the low-budget chick flick from the Maghreb, to Ghassan Salhab’s Beirut-bound allegorical thriller The Last Man. There was an exuberant Egyptian showcase in partnership with the Egyptian Consulate. There were audio-visual experiments at the Liverpool Regional Gallery curated by Khaled Sabsabi in association with Casula Powerhouse. There was even a matinee program for schools featuring the very Aussie comedy Jammin in the Middle E, about growing up Arab in Western Sydney, starring local hip hop artists Matuse and Nomise. Notwithstanding all this diverse and stimulating work on show, we were left in no doubt that the curatorial heart of the Sydney Arab Film Festival lay with the documentaries. Central to the impact of this work on the festival as a whole was the decision to bring Nizar Hassan and Eliane Raheb, two key figures fostering documentary filmmaking practice in the Arab world to Sydney for the festival. Hassan, an established Palestinian filmmaker, presented two works at the festival. Ostura/Fable collected the astonishing, fragmented and everyday stories of three brothers dispersed by the creation of the state of Israel. Hassan spoke about his decision to regularly enter the scenes he was shooting, alerting the audience to his own subjectivity, and stressed the necessity of a documentary filmmaking practice that allows the film’s subjects to lead the way. In Ejteyah/Invasion, Hassan entered his own scenarios under different conditions. For this film, he shot and edited footage of the last days of the 2002 Israeli invasion of Jenin, meeting many of the refugee camp’s inhabitants. He then invited an Israeli soldier who had been driving one of the bulldozers during the incursion to be filmed viewing this footage. In the viewing room with the soldier, Hassan sat just behind his spectator, pausing to ask questions as the frame of Ejteyah/Invasion kept shifting between them watching and a full screen presentation of the astonishing footage taken in Jenin. Foregrounding the act of spectatorship, not only the Israeli soldier’s but also his own, Hassan opened a space in which the audience could begin to judge not just the soldier but the filmmaker too, making himself a character in his own film. By extension Hassan was asking us to examine the impact of viewing his incredible footage. Investigating the effect of being a spectator to the documented suffering of others lay at the heart of the two documentaries presented by Lebanese filmmaker Eliane Raheb, the first of which also dealt with the situation in Palestine. So Near, Yet So Far explored the impact of the broadcast death of a Palestinian child, Mohamad al Durra, on children in the Arab world. After pursuing a young Jordanian boy who went to fight with the al-Aqsa Intifada and a group of children on the Lebanese-Israeli border who stole an Israeli cow, Raheb tracked down a childhood friend who had, in their youth during the Lebanese civil war, suddenly disclosed her Palestinian identity to her young Lebanese peers. 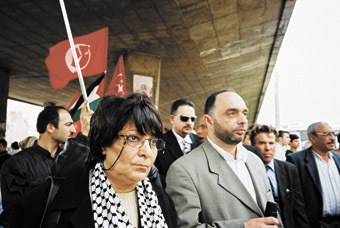 In Suicide/Intihar, Raheb started from her own escalating compassion fatigue and uneasy sense of consumer participation, to propose that the media coverage of the war on Iraq placed the Lebanese people watching it into a state of confusion akin to a strange suicidal inertia—essentially, a state of alienation. From here she explored suicidal acts in Lebanon that had been connected to the war in Iraq, including the disappearance of young Lebanese men who had spontaneously set off to fight in Iraq and never returned. She investigated the suicide of Edgar Aho in Lebanon when the local media broadcast images of his death soon after he jumped claiming he had suicided for Iraq. Raheb met Aho’s family, who learned of his death from television, and was prompted to confront and then deconstruct her own camera’s intrusion into death and grief she had sought to critique. In a parallel festival event, visiting Lebanese journalist Bilal Khbeiz likewise presented a fascinating apprehension of the temporal logic of TV coverage of the war on Iraq. Khbeiz’s headed up Pressure Points, a forum curated by Mireille Astore, presented in partnership with The Writing and Society Research Group at the University of Western Sydney. Khbeiz set up a bleak contrast. He positioned the “high-resolution blurs” of the American photo-journalist embedded with the US Army, unburdened by recognisable victims, as achieving a perverse temporal logic by becoming images of things to come, a warning of future death and destruction. Meanwhile, the “excessive clarity” and “tireless repetition” of images of Iraqi casualties broadcast by Iraqi stations had the temporality of death—of a past without a possible future. In contrast Khbeiz proposed that the Israeli attack on Lebanon was so relentless as to postpone mourning until the end of the war. Thus, for Khbeiz, the war on Lebanon became marked for the Lebanese people by the strange temporality of living in a post-death era. Short works screened with the Khbeiz paper continued to investigate the logic of mediation so central to the work of all the festival guests. In particular, Khaled Ramadan’s short film Wide Power told the story of the filmmaker’s struggle to come to terms with the conundrum of feeling that he was behaving like an Orientalist when behind the lens of the camera in his own country. This concern was at the centre of the festival’s other forum, Under Siege, presented in association with Casula Powerhouse, featuring Hassan and Raheb. Hassan spoke about his refusal to participate in any dehumanising attempt to convince the so-called ‘other’ of his humanity. Instead, in response to what he perceived as the often objectifying and universalising strategies deployed by many documentary filmmakers, Hassan discussed his strategies for allowing his subjects autonomy and for making plain his own agendas and the apparatus with which he works. By entering the frame and by interrupting key moments of spectatorial identification with shots of his crew at work, Hassan established a self-reflexive documentary practice now seen as a common trend in Arab documentary filmmaking, albeit with varying degrees of success. Such a strategy was also at the heart of the Australian premiere at the festival of Leila Khaled: Hijacker. This documentary investigated the aura surrounding the beautiful and armed young 24-year-old who gained international headlines in 1969 as the first woman to hijack a plane and put Palestine on the global agenda. Meeting with the now middle-aged Leila, Swedish born Palestinian filmmaker Lina Makboul placed herself and all her concerns inside the frame, establishing a self-conscious almost whimsical dialogue, opening up new possibilities for thinking with Leila Khaled. At Under Siege, Raheb, spoke about the impetus for co-founding the cultural cooperative for cinema, Beirut DC, where she organises the Arab Film Festival, Ayam Beirut al Cinem’iya. Her discussions centred on Beirut DC’s efforts to open up otherwise unaddressed questions about Lebanese national identity, to foster an audience for independent Lebanese filmmaking, and encourage exchange between filmmakers and audiences across the Arab world, bringing to light the overlapping agendas of her own self-reflexive filmmaking and the work of Beirut DC. Evidently, Raheb and Beirut DC have been of crucial assistance to the Sydney Arab Film Festival as it strives to nurture its own agendas and audiences. Festival co-directors Fadia Abboud and Mouna Zaylah, the organising committee and the festival’s associated partners did much more than present alternative stories to the stereotypes that tend to hold the balance of power in our public spaces. The festival opened up an intense critical space out of which emerged vital tools to apprehend the films on show, their intersections and the significance of screening them together, here, in Australia in 2007. My prediction is that, with these criteria, the feisty and uncompromising Nizar Hassan will have no excuse for not coming back.